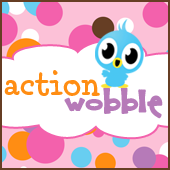 Why don't you give this little creation a try, don't forget to pick up your Action Wobbles, right here! For more pictures please visit my blog! Great card! Will work nicely as a tag too!